The thermal expansion in transmission lines is still limited by obsolete, slow electro-mechanical controls that seriously constrain the amount of electricity that each line can carry. While the copper cables in transmission lines conduct electricity quite well, the electrons do meet resistance that causes at least some energy loss and always generates heat. When hot weather triggers an additional spike in electrical demand for air conditioning, these steel core and copper wires heat up to an even greater degree, expand under the extra load and start to sag. 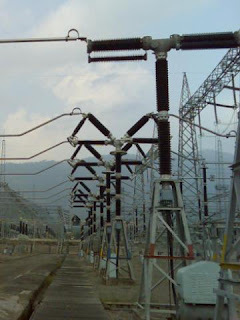 This thermal expansion is still limited by obsolete, slow electro-mechanical controls that seriously constrain the amount of electricity that each transmission line can carry. Up to now, it has been almost impossible to foresee the temperature distribution along the cable route, so that the maximum applicable current load was usually set as a compromise between understanding of operation conditions and risk minimization. 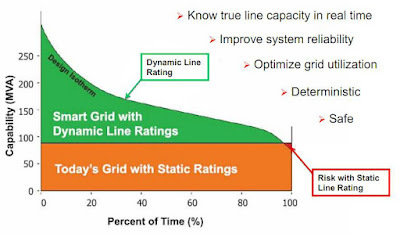 Dynamic line ratings can also help increase grid utilization by allowing the delivery infrastructure to operate closer to its true limits. Concern rises as long-term growth of transmission capacity is dramatically short of keeping up with growth of peak demand. Forecasts predict there will be a less than 1% increase in total miles of transmission cables and GW-miles between 2002 and 2012. According to a 2008 report by The Brattle Group, the electric power industry will need to invest $298 billion in the nation’s transmission system from 2010 to 2030 in order to maintain reliable service Dynamic line ratings have the potential to provide an additional 10-15% transmission capacity 95% of the time and fully 20-25% more transmission capacity 85% of the time. Currently, only a small fraction of the nation’s transmission lines are monitored to support dynamic line ratings. The interviews of electricity service providers conducted as part of DOE's 2009 Smart Grid System Report reveal that, on average, only 0.5% of respondents’ transmission lines were dynamically rated, and that number dropped to 0.3% when weighted by the number of customers served by each respondent. Weather Conditions have a big affect on Line Rating. Ampacity - The current carrying capacity of a conductor (expressed in amperes) under stated thermal conditions. Different materials have a different limit of ampacity depending upon the operating temperature. Those limits are set by the National Electrical Code (NEC). Anneal - Overheating of a conductor, causing it to expand, sag, weaken, and sometimes break. Usually caused by a combination of too much current passed through the conductor and high temperatures in the air surrounding the conductor. DCR – Dynamic Cable Rating (also called RTTR – Real Time Thermal Rating and DTCR - Dynamic Thermal Circuit Rating) Enables not only to continuously monitor the temperature of a high voltage cable circuit in real time, but to safely utilize the existing network capacity to its maximum. DTS – Distributed Temperature Sensing Systems – Optoelectronic devices which measure temperatures by means of optical fibers functioning as linear sensors. Temperatures are recorded along the optical sensor cable, thus not at points, but as a continuous profile. A high accuracy of temperature determination is achieved over great distances. Typically the DTS systems can locate the temperature to a spatial resolution of 1 m with accuracy to within ±1°C at a resolution of 0.01°C. DLR - Dynamic Line Ratings - Typically based on online readings by Distributed temperature sensing (DTS) combined with Real time thermal rating (RTTR) systems. Dynamic Planning Models (aka Operational Models) - Every major electric power utility manages its grid with more than one type of software package. Although each type of model provides a different type of functionality, they are also distinct in the rigorousness with which they calculate the grid's dynamic responsiveness. Grid operators rely on rules that are established using this sophisticated software. Such rules dictate operational limits based on dynamic and voltage stability constraints of the power grid. The onset of problems associated with exceeding these limits are difficult to recognize in real-time, and can lead to unrecoverable situations; therefore, operators must ensure that sufficient margin exists so as not to encroach upon these limits. Limiting Span - Also referred to as the “target span” or “controlling span,” the limiting span is the maximum allowable distance from pole to pole for a specific framing. This span is usually determined by the geometric properties of the framing such as galloping or conductor separation. This span may also be determined by the strength properties of the framing such as the strength of the insulators or crossarm. Sag and Safety Limits. As wire heats up, it softens. Since power lines are hea their weight makes them sag as heat builds. If trees, buildings, vehicles, water or other obstructions touch sagging wires, they may disable the wires. The National Electric Safety Code describes how to cap power flows within the physical limits of the line and how to build lines to ensure that sag does not threaten safety. Sagging lines that come into contact with trees or other vegetation have, nonetheless, caused many small and large blackouts. Measures as simple as tree trimming can prevent many small- and large-scale blackouts. with trees or other objects thus affecting reliability and safety. Thermal Limit – A power flow limit based on the possibility of damage by heat. Heating is caused by the electrical losses which are proportional to the square of the real power flow. More precisely, a thermal limit restricts the sum of the squares of real and reactive power. Colliding electrons in a high-voltage AC power line cause electrical resistance and resistance interferes with current in a wire producing heat. If current flows beyond engineering limits, wires can melt or start a fire. More current can flow over a wire in colder weather, since air cools the line. Dynamic line ratings have the potential to provide an additional 10-15% transmission capacity 95% of the time and fully 20-25% more transmission capacity 85% of the time. An increase in the penetration of dynamic line ratings and the associated measurement equipment will contribute to understanding the status of the deployment of a smart grid. The capacity of transmission equipment is not static, but can change significantly according to several variables, most notably conductor sag caused by thermal properties. Sensors for measuring the impact on sag are appearing more frequently, particularly in pilot programs for critical corridors. Though the number of miles of transmission with dynamic ratings is anticipated to increase, it is so small now as to be negligible on an interconnection basis. The availability of industrial Distributed Temperature Sensing (DTS) systems that measure in real time temperatures all along the cable is a first step in monitoring the transmission system capacity. This monitoring solution is based on using passive optical fibers as temperature sensors, either integrated directly inside a high voltage cable or mounted externally on the cable insulation. A solution for overhead lines is also available. In this case the optical fiber is integrated into the core of a phase wire of overhead transmission lines (OPPC). The integrated Dynamic Cable Rating (DCR), also called Real Time Thermal Rating (RTTR), solution enables not only to continuously monitor the temperature of a high voltage cable circuit in real time, but to safely utilize the existing network capacity to its maximum. Furthermore it provides the ability to the operator to predict the behavior of the transmission system upon major changes made to its initial operating conditions. Synchrophasor technology that has the potential to change the economics of power delivery by allowing increased power flow over existing lines up to a line's dynamic limit instead of to its worst case limit. The Smart Grid will give bulk-power system operators access to large volumes of high-quality information about the actual state of the electric system that will enable a more efficient use of the electric grid through a switch from static to dynamic line ratings. 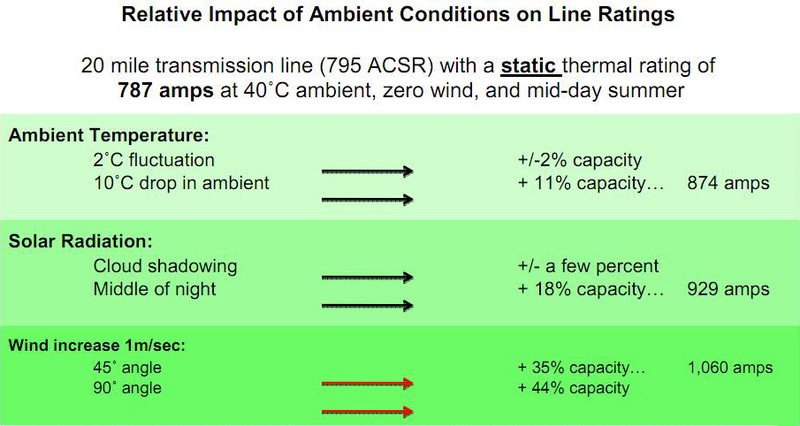 It may be possible to increase the transfer capability of the line by monitoring the line sag to allow higher temperatures/currents. There are two possible approaches one direct and another indirect. The direct approach involves calculating the actual sag of the line at its mid-span using actual information provided by special sensors on the towers about the horizontal tension and ambient temperature. Using this method, the control center calculates the actual limit on the current that the line can handle under actual conditions. The indirect method entails transmitting temperatures and wind velocity and locations of the critical sag sites to the control center by radio or telephone. With this information, the control center calculates what the sag is and determines any dangerous trend. The northern end of the 500 KV inter-tie, Bonneville’s has a giant toaster oven, the breaking resister, and it’s there to stabilize the western interconnection. You could accomplish the same thing with a 300 megawatt battery at the southern end, connected to high speed controls. The economics haven’t been developed, but depends on the relative economics of increasing the transfer limit on the inter-tie. 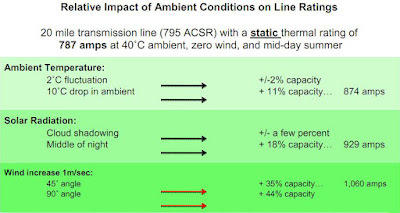 An EPRI study team assumed that AC transmission lines rated 115 kV to 230 kV in the U.S. are most susceptible to being thermally limited. They considered lines rated 345 kV and above are more likely voltage-limited. Albeit, there may be a few lines rated at these higher voltages that are thermally limited – they would be an exception and not the rule. Furthermore, of the lines which are potentially thermally limited, only 50% actually are. There are 85,048 miles of lines at 230 kV. To dynamically rate all 85,048 miles would require one unit per 7.5 miles or 11,340 units. The cost of DTCR deployed in quantity is estimated to be $20,000 initially, declining to $10,000. Multiplied out the Cost of Dynamic Thermal Circuit Rating the US Grid is between $113.4 - $226.8 million. 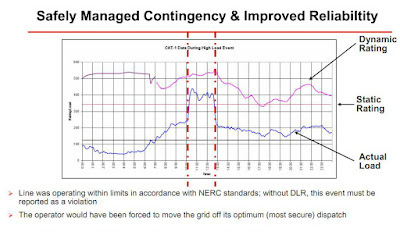 Dynamic rating and real-time monitoring of transmission lines are becoming important tools to maintain system reliability while optimizing power flows. Dynamic ratings can be considered a low-cost alternative for increased transmission capacity. Dynamic ratings are typically 5 to 15% higher than conventional static ratings. Application of dynamic ratings can benefit system operation in several ways, in particular by increasing power flow through the existing transmission corridors with minimal investments. It is estimated that Smart Grid enhancements will ease congestion and increase utilization (of full capacity), sending 50% to 300% more electricity through existing energy corridors. Real Time Thermal Rating will addressing transmission congestion and optimization of the system. Overload - As wires become overloaded, they heat up and sag, making them vulnerable to entanglement with trees and other objects. This happened near Cleveland, Ohio on August 14, 2003. High demand caused a high-voltage line to come in contact with overgrown trees. The resulting cascade of failures plunged many of the 50 million people in the Northeast U.S. and Canada into darkness. Limits on transformers. Transformers exchange power between systems with different voltages, moving it from low to high voltages from high to low voltages. Such transfers release a great deal of heat. The amount of power a transformer can move is limited by the current-carrying capacity of the wire and the ability of internal oil coolers to keep the apparatus within operating temperature limits. Too Much Computation Required - Dynamic planning software providing the highest degree of sophistication, but at the cost of computational speed. The planning software runs on a PC platform, taking about 10 minutes to solve about 25 seconds of grid response for a WECC-sized system. Due to the complexity of this software, these best-in-class software modules are not able to run in real-time, and are not useable in an operational context. High Safety Margin - Since the operating rule sets are established off-line they must be designed to apply to a broad set of operating conditions, implying that excessive operating margin likely exists at various moments and locations, but one cannot safely verify this nor utilize this spare capacity. 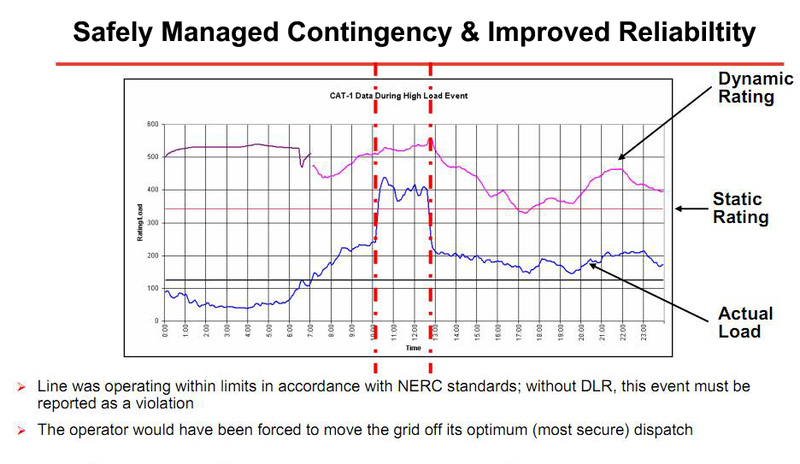 The corollary is that during moments of grid distress, there is excess capacity of the grid that could be used, but it cannot be identified in the short period of time necessary to use it. Pacific Northwest National Laboratory is performing research that is moving these sophisticated dynamic planning models to the operational realm. We are working toward taking these software solutions from 10 minutes to less than a second, much faster than real-time. This is being accomplished by re-writing specific algorithms in this software, enabling the software to operate on a high-performance computing platform. Although Pacific Northwest National Laboratory has access to various computing platforms, we are currently using an Altix Shared Memory HPC platform and software formulated with Fortran 95 with OpenMP Application Program Interface. As research progresses, the methodology and hardware platform for parallelization may be changed. The New York Power Authority (NYPA) has engaged with EPRI in a demonstration project that will evaluate the instrumentation and dynamic thermal ratings for overhead transmission lines. An area of possible application for DTCR is the growing penetration of wind generation; when turbines are operating, one expects higher dynamic ratings because of increased wind speed. The project will use EPRI’s DTCR software, which uses real-time or historical weather and electrical load data to calculate dynamic ratings for overhead lines in real time based on actual load and weather conditions that generally are accessed through the utility’s SCADA/EMS system. Hi, I wonder if any further work was done on this?